New or re-manufactured parts: The original manufacturer/s warranty constitutes all of the warranties with respect to the sale of all items. Manufacturer(s). Most new parts carry a 1 year warranty. Re-manufactured parts warranties can vary from 3 months to 5 years. Feel free to ask about the warranty period before you purchase. Waters Tractor hereby expressly disclaims all warranties, either expressed, or implied, including any implied warranty of merchantability or fitness for a particular purpose, and Waters Tractor neither assumes nor authorizes any other person to assume for it any liability in connection with the sale of all items. NOTE: We value customer satisfaction, as such we will make every effort if there is any problem with your order to contact manufacturer with any possible warranty. Used Parts: Unless specified otherwise on our invoice used parts carry a 30 warranty against defect or failure, provided the part or item has been used correctly and not abused. We warrant that, if the part is defective or fails during the thirty (30) day period, a replacement or full refund will be given upon receipt of the defective part and a copy of the invoice (part must be received by us within 30 days of the invoice date). Buyer must contact us for a RMA # and the item must be returned in the same condition as you received it. A 10% restocking fee may be applied. 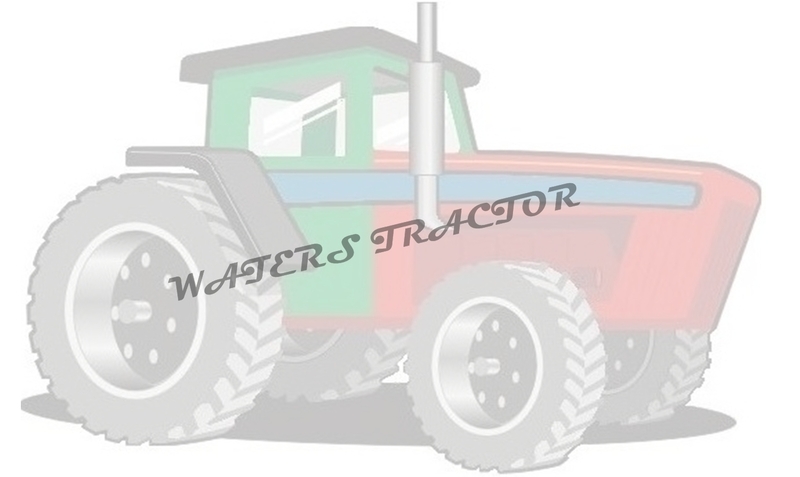 Waters Tractor neither assumes nor authorizes any other person to assume for it any liability in connection with the sale of any used parts. We carefully inspect all parts before shipping and will provide the most complete description we can so you can make your choices accordingly. Used Equipment & Tires: Sold in AS IS condition, unless specified otherwise on the invoice. Waters Tractor hereby expressly disclaims all warranties, either expressed, or implied, including any implied warranty of merchantability or fitness for a particular purpose, and Waters Tractor neither assumes nor authorizes any other person to assume for it any liability in connection with the sale of all used equipment. Limitations of Remedies: Waters Tractor will not be responsible for: (1) damages to other parts or equipment; (2) labor or repair costs; or (3) other claims for damages. Remedies are limited to the price of the part or equipment sold by it, as provided under our limited warranty Under no circumstances will Waters Tractor be responsible or liable for incidental or consequential damages of any kind. The sole and exclusive remedy against Waters Tractor is limited to replacement of the part or refund of the purchase price, at the sole discretion of Waters Tractor, irrespective of the parties agreement otherwise or applicable law. *We cannot be responsible for weather, traffic or holiday related delays in any shipments. PRODUCT PICTURES: Used parts can vary slightly in appearance and condition. Pictures are for illustration purposes and may not reflect the exact product you receive. PRICING: All prices on our website are subject to change without notice. It is possible that despite our best efforts, some products on our shopping cart pricing may have changed or are no longer in stock. We are not obligated to provide products at an incorrect price. Over time, prices may change as our vendors/suppliers raise their prices. If we are unable to deliver any product you place in our shopping cart at the advertised price we will contact you before the order is processed to allow to you accept or decline the order. PAYMENT METHODS: Currently we accept Visa, MasterCard, Discover, American Express and PayPal. SALES TAX: If you are located in Washington, state and local sales taxes will be applied based on your location. SECURITY: We employ the latest encryption and security technology and fraud detection techniques in all of the areas of our store where you provide us with account information. This is done to protect you from unauthorized use of the information that is being sent to our server. PRIVACY STATEMENT: We value the trust you place in Waters Tractor. We ensure that the information you provide is used solely to fulfill and process your order. Waters Tractor does not rent or sell customer information to outside marketers. You may not re-transmit any files from this Website to another Website, or any modified versions thereof, without our expressed consent. You are permitted to electronically copy material published on this site and to make print-outs thereof, solely for your personal information. The information in this Website is provided "as is" without warranty of any kind, either express or implied, including, but not limited to, the implied warranties of merchantability, fitness for a particular purpose, and non-infringement. Disclaimer: We sell new and remanufactured replacement parts for use in the equipment of various manufacturers. The use of any original manufacturer's name/part/model numbers are for reference purposes. Our business and the parts contained herein are not sponsored, affiliated, nor otherwise connected in any way with the equipment manufacturers named in this Website. All registered trademarks are used as reference only.